The Diffusion Group has released new data showing that Roku users have the lowest levels of traditional pay-TV subscriptions and the highest level of cord-cutting. According to TDG, 64% of Roku box users and 66% of Roku stick users subscribe to pay-TV. 30% of Roku box users and 26% of Roku stick users are cord-cutters. For all adult broadband users, 73% continue to subscribe to pay-TV, with just 21% saying they’re cord-cutters. Other devices measured, including Fire TV, Apple TV and Chromecast all had slightly higher levels of pay-TV subscriptions and similar to lower levels of cord-cutting. Whether OTT apps are a replacement or supplement to traditional pay-TV has long been a subject of intense debate in the industry. Netflix’s CEO Reed Hastings, who has alway sought to play down the either/or angle, has insisted that consumers have both cars and bikes in their garages, not one or the other, drawing a parallel to how they’ll subscribe to both SVOD and pay-TV. Others have maintained that with a finite number of hours in the day and ever escalating cost of pay-TV, it’s inevitable that as usage migrates to OTT apps, pay-TV will suffer. One thing not in dispute is that pay-TV subscriptions have steadily declined in the U.S. - though not as dramatically as many forecasted. The TDG data is the first I’ve seen focusing on cord-cutting at the device level. No doubt there will be more to come as well. 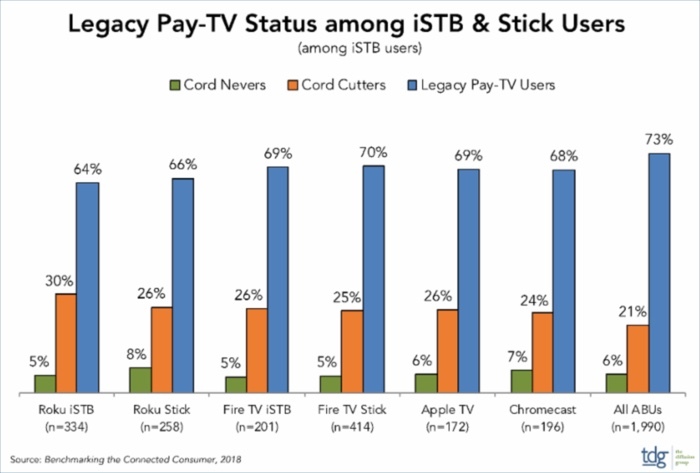 How much of cord-cutting has to do with rising use of connected TVs generally or even use of specific devices like Rokus will be interesting to follow.